If you want something that's all truck with no frills, the 2019 Chevy Silverado 2500 is the one to pick. While Ford trucks are evolving into luxury liners, Chevy is keeping it simple. There's really only a few things a great truck needs needs: a few comfy seats, tires, metal, and enough horsepower and torque to rip tree stumps out of the ground. We say keep doing what you're doing, Chevy. And the buyers will keep lining up to buy it. There's a slight narrowing of options this year, with the discontinuation of regular cab configurations of the Silverado 2500 HD, as well as the double-cab/standard-bed version of the 2500 HD. But there's still plenty to love, and we'll start with the very best thing to prove it. The Chevy Silverado 2500 Heavy Duty comes standard with a 6-liter V8 engine delivering 360 horsepower and 380 pound-feet of torque. That's a lot of muscle for any job, big or small. You can tow 14,500 pounds, or 14,800 pounds when fitted with a gooseneck adapter. There's also a 301-horsepower variant of this engine that runs on compressed natural gas (CNG). But if you want enough torque to make the earth spin faster, upgrade the standard engine to the 6.6-liter turbodiesel V8. It's a heart-pumping, vein-bulging, knuckle-whitening 445-horsepower machine capable of unleashing 910 pound-feet of torque. Put those engaged metal gears to the test with trailers weighing up to 23,100 pounds, when properly equipped. That'll tow most any load, including two-horse trailers, big boats, large metal RVs, and jet skis or ATVs for a family of four. There's also hauling capacity of a whopping 3,204 pounds. If you work hard so you can play hard, the Chevy Silverado 2500 has the power to take you there. Okay, we probably laid it on too thick. There are some comforts to be had in the Silverado 2500 HD. If you don't care about those comforts, get the Work Truck (WT) with its standard vinyl upholstery and flooring, 3-seater bench that splits 40/20/40, folding rear bench, rearview camera, air conditioning, radio and 7-inch infotainment display. If that's all you want, you're good to go. 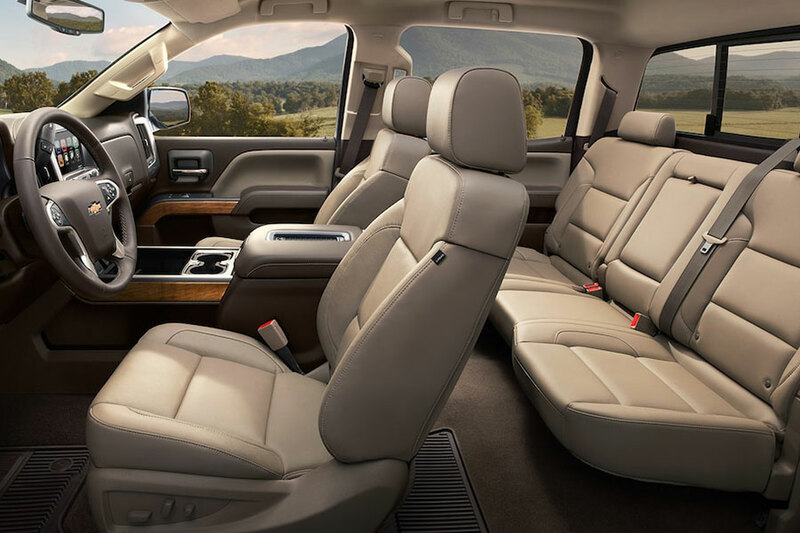 But if you want to put a few of the creature comforts of home in your truck, we recommend starting with the LT or LTZ trims for cloth or leather upholstery and an upgraded infotainment system. These are not the extravagances you find in some Ford trucks, but the Silverado 2500 strikes a happy medium that is sure to please but won't rob you blind at the dealership. For another thing, Chevy offers the MyLink infotainment system, which is simple and straightforward, so you can get back to the road quickly. There's smartphone integration if you want some, so you can have all the same apps in your truck that you have on your phone. Still, at the end of the day, the biggest selling point is all that power and torque. What more could you ask for in a truck?